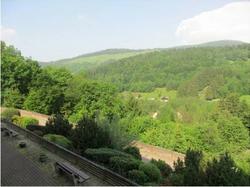 This hotel is located in Sondernach, in the heart of Ballons des Vosges Regional Nature Park. Guests can relax on the terrace with a drink from the bar and eat at the on-site restaurant. All the rooms at A L'Orée du Bois have a private entrance and a mountain view. They all come with a satellite TV and include a private bathroom with a shower. A Continental breakfast is served every morning in the communal lounge. The hotel's restaurant offers à la carte dining with traditional dishes from the region. A L'Orée du Bois provides free Wi-Fi and free private parking is also possible on site. Munster is 9.5 km away and Colmar is 27 km away. This room has wooden furniture and offers a private entrance and a mountain view. It comes with a satellite TV and a private bathroom with a shower.